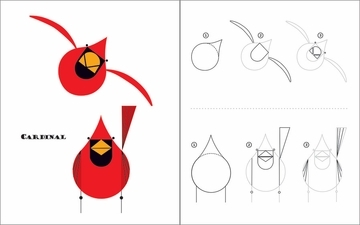 Three sequential line drawings that show how to draw each bird plus two blank, uncoated pages for drawing Harper's original image in full color. This step-by-step visual guide to drawing twenty-eight birds as portrayed by artist Charley Harper progresses from simple to complex images, from cardinals through owls to a roadrunner. 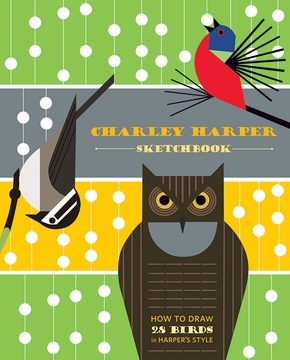 An avid naturalist, Charley Harper particularly liked to paint birds. He masterfully portrayed a host of species using simple lines and shapes. 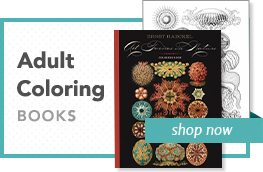 From the smallest songbird to the largest seabird, Harper conveyed not only the form and coloration of his avian subjects but also their personalities. His minimalist approach did not reduce the impact of his art; instead, it offered a bold and unique interpretation of nature’s winged beauties.